Composer(s): Amir Derakh, Naofumi Hataya, Hideaki Kobayashi, Fumi Kumatani, Yutaka Minobe, Gunnar Nelson, Tomoya Ohtani, Jun Senoue, Keiichi Sugiyama! 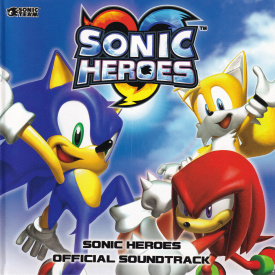 Sonic Heroes Official Soundtrack is a single disc "best-of" album of the music from the 2003 game Sonic Heroes. Released in the United States, it combines the vocal songs from Triple Threat Sonic Heroes Vocal Trax with the main level themes from Complete Trinity Sonic Heroes - Original Soundtrax, similar in style to the previous western Sonic soundtrack, Sonic Adventure 2 Official Soundtrack. This would also be the last such album available outside of Japan until 2011, when select SEGA-related music began appearing on digital download services such as iTunes and Amazon MP3. This page was last edited on 26 February 2019, at 23:29.